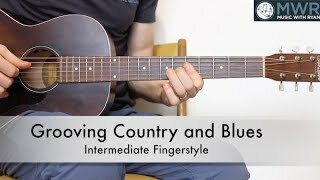 This week's featured lesson is a fingerstyle piece I've entitled 'Grooving Country and Blues.' It's in the key of A and we'll be using the alternate thumb bass throughout the entire arrangement. It has a "Travis-style' feel to it for sure. It's a standard 12 bar blues chord progression and we'll play a simple melody overtop the bass part. This is a nice intermediate arrangement to help you get going in this style of music. You'll get access to all lesson materials by purchasing this lesson or becoming a premiere member! You'll get access to all practice tracks by purchasing this lesson or becoming a premiere member!